WICHITA BIG SCREEN - A Division of 13th DREAM ENTERTAINMENT! Why we're raising funds for the Starlite! There is still a lot of confusion as to why we're asking for donations. I'm going to recap a bit here next but then will copy and paste info from a previous post that provided a more detailed description of donation incentives, etc. 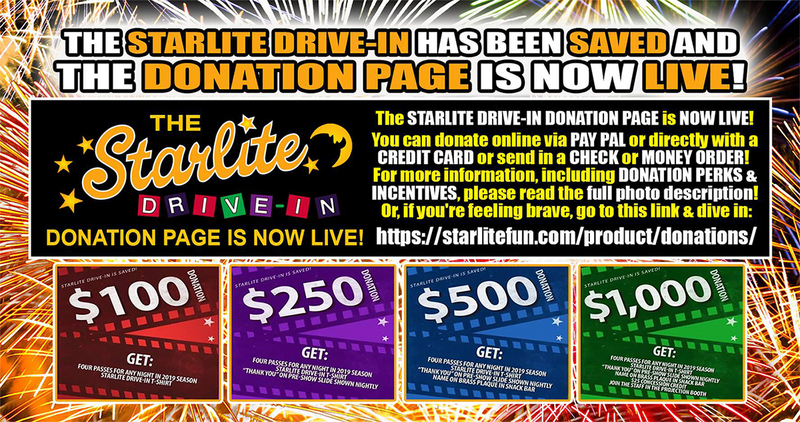 As you may know, it was going to cost around $1M, yes, one-million dollars, to save and relaunch the Starlite Drive-In - which was at least $250,000 out of most buyers comfort zone. Many of us who rallied to save it had to make a choice, either help kick in to buy new projectors or say goodbye to the Starlite Drive-In forever. There was no question it was worth saving so we started the PLEDGE PAGES and within a couple of weeks we had over $50,000 in commitments! 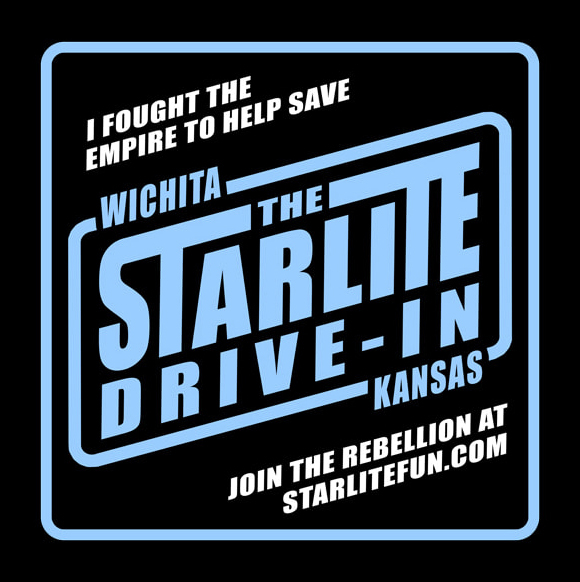 These pledges showed solid evidence of genuine community support which not only convinced the new owner to roll the dice and buy it, it also inspired the City of Wichita to LOAN us all the money for the projectors - so the Starlite could open sooner than later. We accepted the responsibility of rallying all of Wichita to help kick in to the cause and the time has arrived to start sending in what you pledged. If you can't send in your pledges right away that's no problem, but if at all possible please try to get them in within the next month or two? Cool? A few have asked "Why donations?" The even shorter answer is: "WE ARE FIGHTING TO SAVE THE STARLITE!" Now, for those who want, or need, more info before donating, scroll down to the bottom and read the "P.S. - WHY DONATIONS?" section for a more detailed explanation! 1. FOUR Passes for any night in the 2019 Season! 2. ONE official STARLITE DRIVE-IN T-Shirt! 3. "THANK YOU" on PRE-SHOW Slide Shown Nightly! 4. YOUR NAME featured on a BRASS PLAQUE in the Snack Bar! All sized donations are welcome, even as low as $1.00, and they ALL do help. For donations less than $100 or over $1000, when you click on the Donation "Choose an Option" drop down, there is an entry for "Name Your Amount". If you pledged $20, that's fantastic, just plug the amount in here! If you are kicking in $5000, this is the place to plug that in too! DONATE via PAY PAL: Once you get through filling out the online forms, at the bottom of the page is a button that reads PROCEED TO PAY PAL. Click it and the PAY PAL sign-in page comes up. Sign in and go from there! DONATE via CREDIT CARD or DEBIT CARD: For those who just want to pay ONLINE with a CREDIT or DEBIT CARD without using or creating a Pay Pal account, at the bottom of the Pay Pal sign in page is button that reads "Pay with Debit or Credit Card". Click on it and Pay Pal will take you to another form. Fill in all the needed info, click on the "Pay Now" button at the bottom of the page, and you're good to go! No muss, no fuss, and in the end we all get to keep on going to the Drive-In this year! Thanks for all the support everyone! We'll see you at the movies in 2019! 01/14/2019 P.S. - WHY DONATIONS? (A more indepth explanation.) During the whole chaotic period of transition when the Starlite was being sold to developers with the intention of demolishing it and building a warehouse complex, sadly the fairly new 4K Barco Digital projectors were sold off. Once the effort to save the Starlite kicked into overdrive, a serious search was made to track them down and hopefully buy them back, but it turned out they had already been resold and the new owners wanted to keep them - which was their right. Unfortunately, once the new buyers indicated they were willing to back off the purchase, in order to match their purchase price, as well as the projected income from gutting the rest of the property at auction, the new buyers had to come up with a whopping $850,000 to buy it. Add in the extra expense of approximately $200,000 for new projectors, it is going to cost around a million bucks, yes $1,000,000.00, to save our beloved Starlite - which frankly would have caused most potential buyers to run away screaming. Thankfully the city listened to the citizens of Wichita, recognized the Drive-In wasn't just a rare, unique feature in our town, but was actually a legitimate quality of life provider that needed to be saved. They reached out to all the parties, helped find a new buyer, helped them all come to a deal AND voted to loan the Starlite $200,000 so the new projectors could be bought sooner than later so the theater could be reopened as soon as possible. 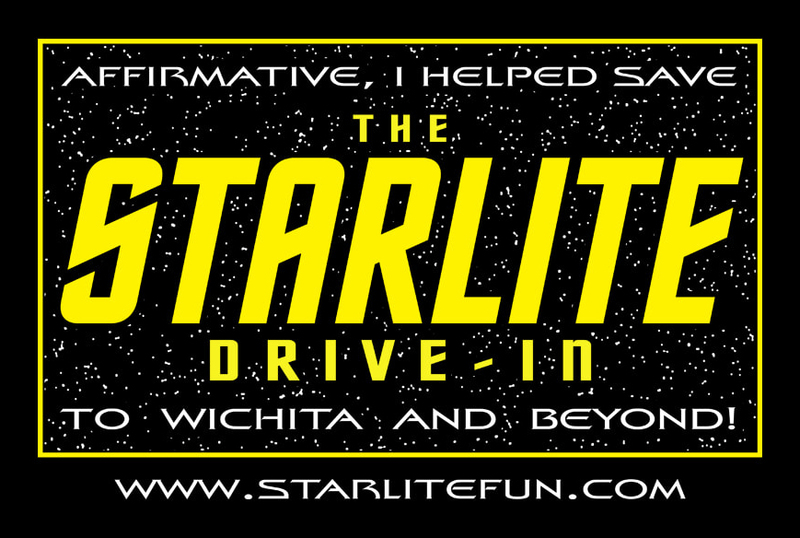 Even with ALL that, most potential buyers would be reluctant to take it on - until Wichita PROVED it really wanted to keep the Starlite by pledging $50,000 in donations over just a few days. So it came down to US - help raise $200K to pay off the loan for the projectors, or lose the Drive-In FOREVER! The answer to the question "Why donations?" is obvious - WE ARE FIGHTING TO SAVE THE STARLITE! I've donated $100. If you can kick in $15, $20, $25 - IT ALL HELPS. Many are kicking in $50, $100, $250, $500, $1000 - a few have pledged $5000 - IT ALL HELPS! 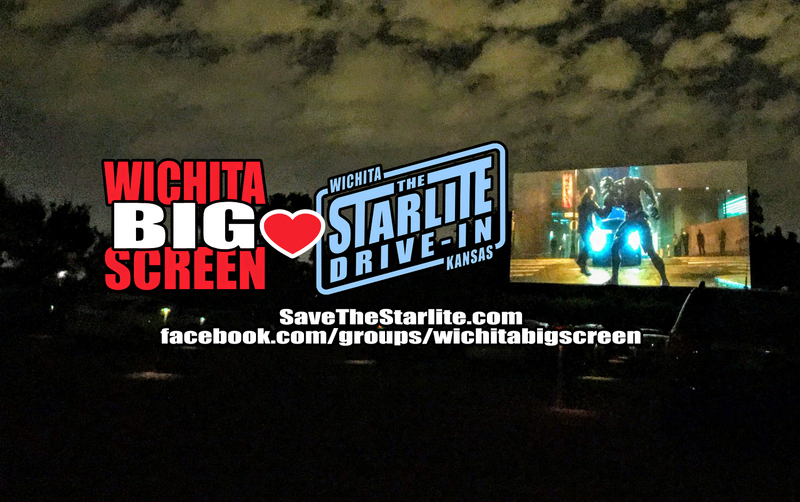 The new owners have taken a big leap of good faith that Wichita will support the Drive-In, and it's time to prove their trust is justified! Let's do it Wichita! I love movies and want to make movies.